With its gorgeous fall colors and harvest celebrations in full swing, autumn is a marvelous time to visit Sonoma Valley. 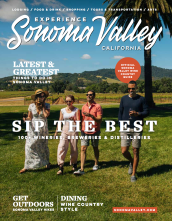 If you’re a beer lover thirsty for seasonal brew, our wine country destination can hold its own with local craft breweries that are long on taste and hospitality. Just down from the Sonoma Plaza, Sonoma Springs Brewing Company’s taproom features a warm laid-back vibe and more than 20 beers on tap. Founded in 2008 by brewmaster Tim Goeppinger, the brewery serves up a variety of California IPAs, Bavarian style beers and barrel-aged combinations. Fall releases include Dunkelweissbier, Thor Blonde Bock, Bruja Majik Verano Alt and a barrel aged Roggenbier, plus take away howlers, growlers, bottles and cans. For more Oktoberfest fun, nothing beats a spacious beer garden, menu of tasty bites and live music. You’ll find this and more at HopMonk Tavern, Dean Biersch’s popular Sonoma outpost made from authentic reclaimed materials. Camp out with a High Water Camp Fire Stout by the fire pit or quaff a signature HopMonk IPA or Hefenweizen. You and your group can also enjoy a great selection of bottled beer, as well as the child- and dog-friendly patio. In the town of Kenwood in northern Sonoma Valley is the Palooza Gastropub. Palooza is a neighborhood gathering place, a relaxed and friendly environment where wonderfully flavored, thoughtfully sourced food and drinks bring friends and family together. A unique wine country restaurant with 16 craft beers on tap, a great selection of local wine, and fun events for the Valley. Palooza also has ping pong, dart boards and a pool table. Guests should also check out the kid- and dog-friendly patio, and the giant Jenga set. Known for its delectable seafood and steaks, Sonoma Grille and Bar is also staking claim on the microbrewery scene and earning raves for its artisanal SG Avalanche Pale Ale. In Sonoma’s historic creamery building, B&V Whiskey Bar & Grille’s house-brewed beer complements its expansive lunch and dinner menu. You’ll also find a great selection of local craft beers–and friendly locals–at Steiners Tavern and Town Square Bar in Sonoma’s lively downtown.